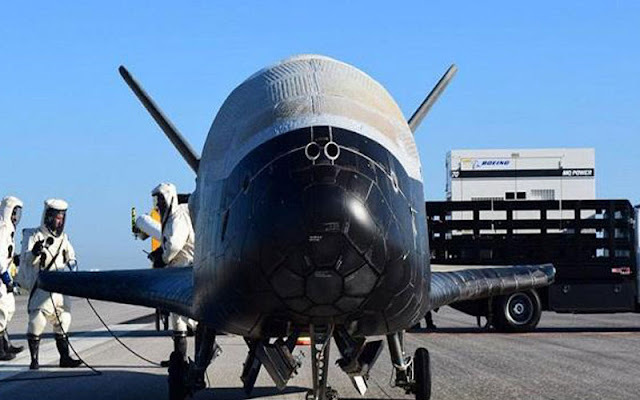 Spacecraft X-37B United States Air Force has returned to Earth Sunday of the secret mission in orbit. The US air force claimed it was running a secret mission 718 days in outer space. Spacecraft in unmanned. The location of her landing at NASA’s Kennedy Space Center in Florida. The X-37B aircraft landing marks the first landing at the Shuttle Landing Facility Space in space since the last flight of the Atlantis aircraft for NASA’S shuttle program in July 2011. The Mission has been completed it is known as OTV-4 (Orbital Test Vehicle-4). This mission is the fourth time for the X-37B aircraft, but it is the first time for a landing in Florida. Three previous landings took place at Vandenberg Air Force Base in California. “This mission once again set a record of the resilience of the orbit and marks the first landing of this vehicle in the State of Florida,” said Lieutenant Colonel Ron Fehlen, program manager of the X-37B. “We are very pleased with the performance of the space vehicle and is very enthusiastic about the data collected to support the scientific community and space,” he said again, as quoted Russia Today, Monday (8/5/2017). The purpose of the program X-73B is twofold. First, wanted to test the spacecraft’s technology that can be used again for future America in space. Second, to conduct experiments which can be returned and checked in the Earth. “The technologies tested in the program guidance, navigation and control, thermal protection systems, avionics, structures and high-temperature seals, insulating a convertible version that can be customised, the system of electromechanical flight a lightweight, advanced propulsion systems, materials and autonomous orbital flight, entry and landing,” said Fehlen. The x-37B, 29 feet in length and has a wingspan of more than 14 meters, was launched vertically and horizontally back to Earth for landing on the runway.